A new year means a new group of students! Students that you don't know yet. How do you learn as much about them as you can in a short amount of time? One way I get to know my new students better is to use a reading interest survey to let me know what things they like and are interested in. I have created a Favorites List. I got the idea as I was reading 100 Minutes by Lisa Donohue for our book study earlier this summer. Donohue suggested grouping students by interest levels. 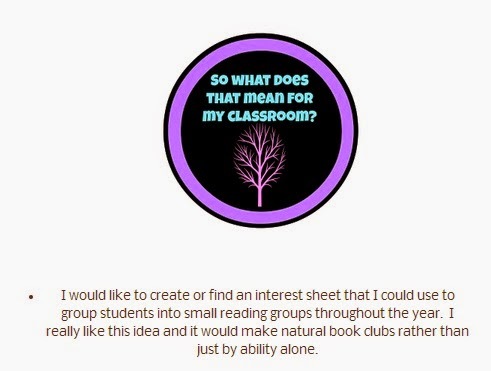 This idea intrigued me, so I created a form to capture my new students' interests at the beginning of the year. As we all know, if a child is interested in the material, he or she will be more willing to complete the lesson. I can't wait to find out what my new students' interests are next month! I have had the same class for two years in a row, so it is going to be an adjustment to learn about new students. 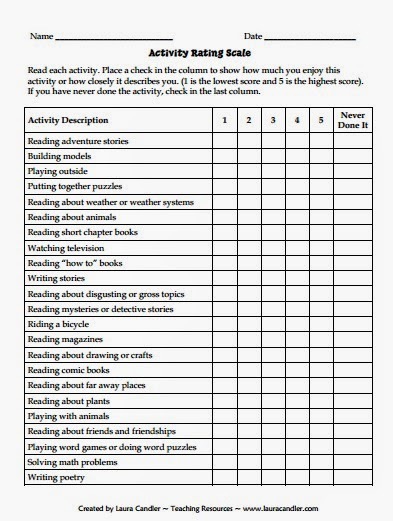 I am also going to have them complete this Activity Rating Scale from Laura Candler (pgs. 3-4). 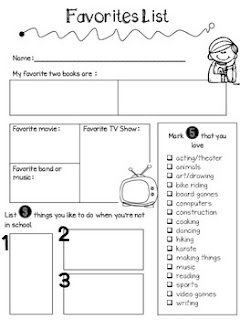 The first two pages are an alternate reading interest survey you could use as well. How do you learn about your new students at the beginning of the year?